Selected in the fifth round (42nd overall) in the 2016 CFL draft and signed on May 23, 2016. 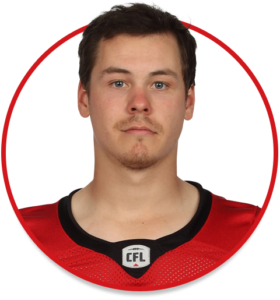 (Calgary) Caron was the Stamps’ long-snapper for all 18 regular-season games as well as for the Western Final and the Grey Cup. He had three special-teams tackles during the regular season and one special-teams tackle in the Grey Cup. (Calgary) Caron played 17 games at long snapper and had six special-teams tackles. He was placed on the one-game injured list for Game 3. Caron played in both post-season games and sealed the Stamps’ Western Final victory when he recovered the loose ball after a fumbled punt. (Calgary) Caron played all 18 games as the team’s long snapper and had one defensive tackle and three special-teams tackles. He also played in the Western Final and recorded a special-teams tackle in the Grey Cup. Caron was a linebacker and four-year first-string long snapper for Laval. In 2015, he had 7.5 tackles and was a key part of a Laval special-teams unit that led the Quebec conference in field-goal percentage and was second in punting average. Prior to going to Laval, Caron played football at Kent School in Connecticut.